MyVidster Developer Blog: Making myVidster more social! The two most requested features that I get from users are more integration with social networks like Facebook and Twitter and a mobile app. While the idea of building a mobile app is worthwhile, there are a lot of technical barriers and could easily take months to develop. For now I am going to hold off on building a mobile app and continue my work on the myVidster site. Users can connect their social network accounts (Facebook/Twitter) to myVidster so that other users in your social networks can find and follow you. 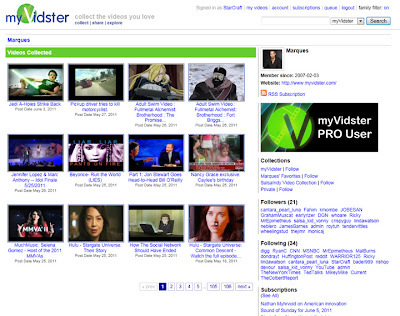 myVidster will automatically find other users in your social networks that are using myVidster as well! Also out of curiosity myVidster will not auto post to your social networks. This feature is in beta, please provide feedback and report any issues. After you have linked your social network account(s) to myVidster you can use your profile photos for your myVidster profile photo. The reasoning behind using the user's social network profile photo instead of allowing users to upload a photo is to reduce redundancy. myVidster directly links to the photo from your social network so that if you decide to change it (which most people do regularly) you will not have to updated your photo on myVidster. The social sharing buttons have been available on myVidster for some time. Recently I have made a few updates to make them more useful. When you bookmark a video, the confirmation page now gives you the option to share your video bookmark with your social networks (Facebook, Twitter, etc). Before you would bookmark the video then navigate to the video bookmark page to do this. I have also added the tumblr share button. The last few weeks have been busy and I am continuing my work with improving site performance (expect faster page load speed during peak hours) and solving issues. Well its time to have another cup of coffee and back to work! It is true that sometimes users could no longer take back the messages from Facebook or other social media apps but what about tech solutions to these kinds of issues? Wow. Very useful update. Social networks are a big part of our lives. Facebook, Twitter and YouTube can prove this. Nowadays, for example, when student want to buy college research papers they don`t hit Google anymore. They are trying to find someone in social networks. That is why this update is extremely useful. Well done! To obtain the login page, open your preferred internet browser. fidelity 401k login The Frequently Asked Questions quick-link in the Need Help Logging In. Social life is very important. By the way, these helpful advices will be useful for you if you want to write classification essay and find out more about it. Wow, new application in social media. Random slow page loading and timeouts resolve!